I love the ocean and being by the coast, so hitting the seaside town of Nha Trang sounded like it would be right up my street, and in many ways it was; the only complaint would be the vast numbers of other tourists there. Anyway, we arrived in Nha Trang very early in the morning - around 5.30am to be exact - after taking the overnight train from Ho Chi Minh City. The train was a very interesting experience, and not as bad as I had expected to be honest. The facilities aren't glamorous by any means, but the compartments were adequately sized for four of us in each one - we could even squeeze in a few extra for some rounds of drinks and card games before we actually slept - and have air conditioning and even power points for charging. Bedding is provided, but it's recommended to get a thin silk sleeping bag, as they may not be changed between every passenger. The bathrooms aren't wonderful, and I recommend taking your own toilet paper, hand sanitiser, and newspaper or something to cover or wipe the seat, but they were at least usable. I also experienced possibly the worst wake up of my life, when they blasted music throughout the train about 15 minutes before arriving in Nha Trang, and allowed the whole Vietnamese song to play before making the announcement, then eventually shutting up. Since we arrived so early, we couldn't check into the hotel yet, or really do much else to be frank, since not much is open at that time, though the streets seemed to be busy enough. Our tour leader took us to one of the only breakfast places open at 6am, which happened to sit right on the beach front. I am not, nor will I ever be, a morning person, but after that rude awakening on the train, this was actually a rather idyllic way to pass the early hours of the morning. Vietnamese breakfasts typically include their style of baguettes, a habit inherited from the French I'm sure, and more of that splendid coffee of course. We even got in an hour or two of swimming and sunbathing after eating, and it was beautiful to have the beach more or less to ourselves, since it certainly gets much busier later, and it was still relatively cool that early in the day. When we eventually reached a more reasonable hour, a bus came along to pick us up for a boat trip, to visit some of the nearby islands, and do a spot of snorkelling. The first island was home to many locals, in a small fishing village, which looked very pretty from afar, with bright houses and colourful traditional boats (like the one we were on) moored in the harbour. Theirs was clearly a much simpler lifestyle, as the town lacked most modern amenities, though we passed by the local market, some basic shops, and the school. The locals were bustling around, doing jobs and errands, and there were many children roaming around, even following us, as the school was shut for the holidays. The kindergarten was still open though, so we stopped to visit, and naturally, I felt right at home there. Again, it was a basic setup, with around 30 or so small children sitting together outside being fed their snacks. We went over to talk and play with them, and the girls I sat down beside were captivated by my hat, which they tried on, and my camera, leading to some cute snaps of them, especially when they figured out the selfie screen. It was a million miles from what my old kindergarten in Hong Kong was like, but the kids were just as adorable. Around the other side of the island, we encountered another harbour crammed with those bright fishing boats, and also witnessed people paddling across to the them in these large bowl shaped vessels. We didn't try one of those, but did ferry across the water on a wooden platform, being pulled along with a rope, which took us over to a fish farm. Sections of water were cordoned off, with wooden walkways all around, and inside them were all sorts of fish, alongside rays, crustaceans and the like. It was a little wobbly on those platforms, and made me fear for the electronics in my bag, but no one fell in! Back on board the boat, we sailed to the next island, where we moored near the coral reef. The masks and fins were provided, and after slapping on the sunscreen again, we dove in. I always enjoy snorkelling, and have been trying it over the years, ever since I was a kid. I remember thinking of the reef as a "fish village" when I was little, and I guess that still holds true. I did enjoy exploring the waters again, and it's quite nice that it's a quiet, peaceful experience, but I was a little disappointed by the state of the reef. I'm no expert, but sections of it looked a bit damaged, and there were bits of rubbish floating around, and while I still saw plenty of fish, it lacked the vibrancy of reefs I've seen in the Philippines and in Belize, which have been my best sites so far. We boarded the boat again, and the crew started preparing our lunch. Unfortunately, a few of the group felt seasick at this point, and ended up missing a lot of the meal, though we kept back food for them to have later. We got spring rolls, chicken, beef, fish, prawns, egg and rice, and a bucket of cocktail to wash it down. Then we moored at one more island to spend an hour or so relaxing on beach chairs in the sun. The actual beach there was very busy, and we'd been awake for many hours at this point, so we mostly just stayed in our chairs, dozing and chatting, before heading back as the rain clouds started to gather. We were able to check in to the hotel by the time we got back, and had a few hours left of the afternoon, so I went off to explore the town a little more. It was much busier by this time than it was when we arrived that morning, both with pedestrians and traffic - Vietnam has more motorcycles than I've seen in my life! I did a large loop, along the beach front and back through the streets to the hotel, which took about an hour. The streets were a mash of traffic and hotels and shop fronts, small stall vendors every now and then, but it's still a small town, so it didn't feel as crazy as Ho Chi Minh. The beach front was nice, though there were a ridiculous amount of beach chairs on the sand, but it looked clean and peaceful, and there's a park bordering the beach, so it's not next to the main road. It was nice to stroll along the sand in the cooler early evening, and I particularly enjoyed people watching as I went; my highlight was a group of half a dozen elderly ladies standing in line in the park, massaging each other's backs. I reached the large central square too, full of children on rollerblades or flying kites, and saw the town hall and Tram Huong Tower. Then on the way back I happened upon a market, which looked very pretty and colourful with its lanterns hanging overhead. It was mostly selling souvenirs, clothes and other typical tourist fare, and I didn't buy anything from it, but it was quite a nice one just to walk through and browse for a while. That evening we went for a group dinner, and our tour leader took us on a taxi ride and then a short walk to this large, barn like building, which turned out to be an excellent Vietnamese barbecue restaurant. She ordered a selection of dishes, and we cooked them ourselves over small coal fire pits set along the table. At times it could be frustrating waiting for it to cook, and the smoke made things pretty hot inside, but barbecuing like this is always a fun experience (I've done Korean a few times in Hong Kong), and it was great to discover this local, hidden spot, that we'd have likely never found without her help. Some of us went for a few drinks in Why Not bar, just around the corner from the hotel, but after a couple of cocktails, I called it a night, and didn't stay out very late. Then I spent the next morning sleeping in too, but I think I needed it after such a long day! 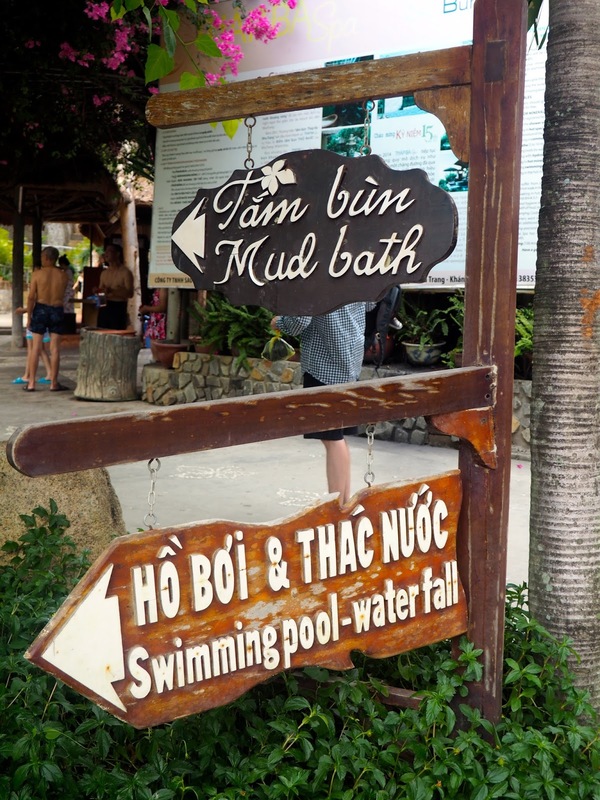 On the afternoon of our second day here, we took a trip to one of the many mud baths around Nha Trang, and our guide took us to Thap Ba Spa, as it's the original mud bath. There are various packages and prices on offer, and we opted for the communal mud bath, as there were about a dozen of us going (private ones cost more naturally). We all climbed into the tub and the mud poured in around us, and we had buckets to pour it over ourselves too, or you could just lie down completely and allowed yourself to be coated in it. The mud was nice and cool too, which is good in this summer heat, and you could pretty much float if you wanted to; at one point the whole group allowed ourselves to float and we all drifted around in a circle. You can stay in the mud bath for 20 minutes (it's not good for you to stay in longer), and the staff inform you when your time is up, at which point we all sat down to let the mud dry and sink in for a few minutes, before showering it off. Then there is a hydrotherapy shower, where you walk through jets of water blasting you from all sides, which is actually pretty painful if you stay in for too long! And finally you get another 20-30 minutes in the hot springs, another tub which we all sat in together, and filled up with natural, warm mineral water. I could've almost drifted off in that one! We also had access to the swimming pool and waterfall, which we spent a little while in at the end, before getting ready to leave. The waterfall was quite a pretty one in particular, and gives you a good back and shoulder massage while sitting under it! The bus dropped us off back in town, and we still had a few hours to spare before our next overnight train, so we decided to check out Long Son Pagoda. It's a bit of a walk from the town centre, so we saved a bit of time by jumping in a taxi, which is pretty cheap, especially when split between a few people. As I've found with temples and wats in the past, pagodas can all start to look similar after a while, but this one stands out because of it's large Buddha statues. Entering the site, we were met with the main hall, with it's Buddhist shrine, and typical displays of flowers and brightly coloured designs and statues. Then around the back, we climbed up the small hill to see the large reclining Buddha, and even larger seated Buddha statues, both highly impressive. The bright white colour of them makes them stand out too, especially for me being used to seeing mostly bronze or gold coloured Buddhas in Hong Kong. The hilltop also allowed us to see the view over Nha Trang itself. We got a taxi back to the town centre, and stopped to grab some dinner on the way, taking a break from Vietnamese food to try out a recommended Indian place (Omar's), which was as good as we had been told. And then it was back to the station to catch our next overnight train north - thankfully this one spared us the loud music! The compartments were a little smaller, but all in all, it wasn't a bad journey. Nha Trang is a nice seaside sort of town, definitely a good spot if you want some beach time, swimming or spa treatments, and I've heard the water and theme park is excellent (not something we did, as when prioritising things to do in just 2 days, theme parks lose out since you can go to them anywhere really). Yes, it's quite touristy, and I wouldn't have spent more than a few days there anyway, but as someone who loves being by the ocean, I certainly enjoyed my time there.